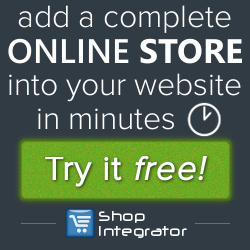 Description: Add an online shop into any website with the ShopIntegrator hosted shopping cart ecommerce software. ShopIntegrator provides small to medium sized businesses with secure, easy-to-use hosted shopping cart software that is PC, tablet and mobile compatible. Businesses can use ShopIntegrator in their website to sell tangible goods with shipping costs, sell digital download products such as e-books, music and audio tracks, video, and to sell personliased items. There is no software to install and its uncomplicated, no cost set-up requires little technical knowledge and can be added into HTML website templates, DIY site builders such as Weebly, Moonfruit, Yola, Webnode, 1&1 MyWebsite, 123-Reg, Sitejam, Webs, SquareSpace and Vistaprint, to name a few. ShopIntegrator also has dedicated plug-ins to simplify adding ecommerce into popular Content Management Systems (CMS) such as WordPress, Drupal and DotNetNuke (DNN). Thanks for your interest in the ShopIntegrator affiliate program. We're really excited that you want to join us and are looking forward to working with you. Please do get in contact with us with any ideas you have to improve our affiliate program. Turn any website into an online store in minutes with a simple copy and paste. Sell digital downloads from your website in minutes with a simple copy and paste. Sell e-books, sell audio and music tracks, sell video, sell software, sell any file downloads. Easy to use hosted shopping cart software to add-in and online shop into your website in minutes. No hassle, no fuss, just start selling online today.